Second stop in our journey around the globe in the search of the 10 best cities to skate : Berlin, Germany. First stop in our journey around the globe in the search of the 10 best cities to skate: Berlin. Berlin is a fierce competitor to Barcelona for the status of European Capital of Skateboard. Skaters, locals and journalists are even talking about skateboard in Berlin as a sub-culture. How skateboard came to be so deeply anchored into Berlin’s culture? What are the singularities of the city to bring both passion and respect among the skateboarders’ community – nationally and internationally? During the 80’s, the German Democratic Republic GDR (East Berlin) was the stage of a lot of gloomy childhood, dictated by communist rules. Skateboard, this sport imported from USA, was an act of civil disobedience. The skateboards were made with “what’s to hand” and only a handful of skaters could be found; they all knew each other and were like a family, sharing the same values, passion and danger of this intolerable sport. After the fall of Berlin’s Wall in 1989 and Berlin’s reunification, Berliners from the Eastern part migrated massively toward bigger and brighter shores on the West, leaving behind vast areas and industrial lots, an oasis for skaters! Skateboard democratized and the scene began growing. The best testimony about Berlin’s skating history is indisputably Marten Persiel’s documentary “This ain’t California” (2012). The movie was diffused all around Europe and even in USA in various festival, and won several awards: Best Documentary at Cannes’ Festival in 2012, Best Scenario and Best Movie-Maker at the International Skateboard Festival of Los Angeles. Even if skateboard is a democratized sport nowadays, the roots are still. The young generation still perceive skateboard’s culture as a way to express their unique style and a way to see the world differently to “normal people”. The sport conveys a certain idea of multiculturalism, which is acknowledge in the spirit of friendship, freedom and joy of community. The singular way of thinking and living skateboarding before the Wall fell down remains. Berlin is characterized by its constant construction. No matter where you look, you can always see cranes in action. This perpetual development offers the most complete Europe’s playground for skaters, as new spots are appearing almost every day! The city is overflowed with skateparks and street spots, more various and unique one than the other. This is what make Berlin different from Barcelona and produces its unique shapes: rough ground, rusty edges, cracks, cobblestones and DIY spots. Despite the large number of skateparks, they are quite far away from each other. One tip if you want to make the best of your skateboarding day: localize them before going on session! Skatehalle: the biggest indoor skatepark, good option when it’s raining (which can happen quite often), hidden behind enormous warehouse plastered with graffiti tags, in the heart of Friedrichshain district. 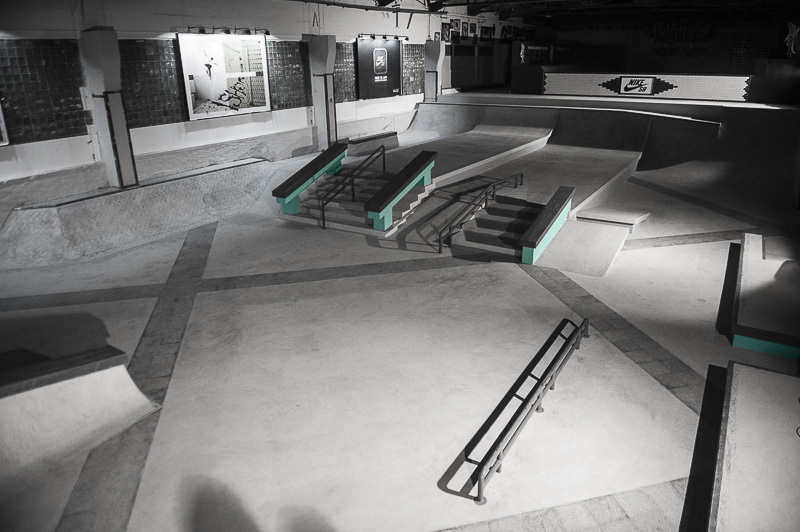 Bétonhausen: skatepark composed of 2 bowls – indoor and outdoor – with DIY inspiration giving the place a unique spirit. If you are familiar with Berlin’s skating scene, or even with historic iconic skateboard spots, you might know Warschauer Strasse and its mythic series of benches whose edges were covered in metal. Unmissable, this spot was often the starting point of street session, the venue of the annual Battle at the Bänke Comp for the Go Skateboarding Day, and through the years, some of the world’s best skaters have carved their mark into the benches history. This time is over, as the 21st August 2016, the benches have been removed without official reason. It was – and remains – a big loss for Berlin’s skate culture. The strong and meaningful history skateboarding is carrying combined with the urban characteristics’ and uniqueness of Berlin raised skateboard as a sub-culture. More than a sport, a way of life, skate culture could be assimilated to the broader sense of friendship and family. No matter which part of Berlin you want to go, you can take your skateboard and immediately find people you have something in common with. It’s a feeling that makes skaters unique here. Berlin is now your next destination? The free magazine Anzeige Berlin documents the skating stage of Berlin and gives an overview of the current street spots, see you there!